The point is that although Zizek's unauthorized approach has cost him the chance to become part of the established institutions on at least two occasions (once with his Master's thesis and once with his second Doctorate), he has defined his position only in his resistance to those institutions. This is not necessarily a question of Zizek initiating some kind of academic rebellion, nor even of proving how in the long run his talents have surpassed the obstacles erected against them, but rather of claiming that the character or identity of Zizek's philosophy is predicated upon the failure of the institutions to accomodate his thought. The eventual success of Zizekian theory proceeds partly from its clearly failure, from the fact that Zizek was able to perceive himself as alien to the system in which he worked. It was this alienation, this difference to the discourse of philosophy of which it was and is a part, which forged the identity of Zizek's own thought. Because Zizekian theory was no part of the objective system, it was in itself subjective. The reason that this is so pertinent is that Zizek describes the formation of what is known as the "subject" in a similar way. 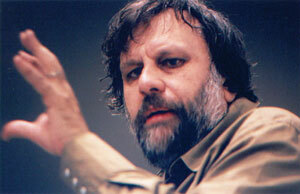 Indeed, one of Zizek's main contributions to critical theory is his detailed elaboration of the subject.